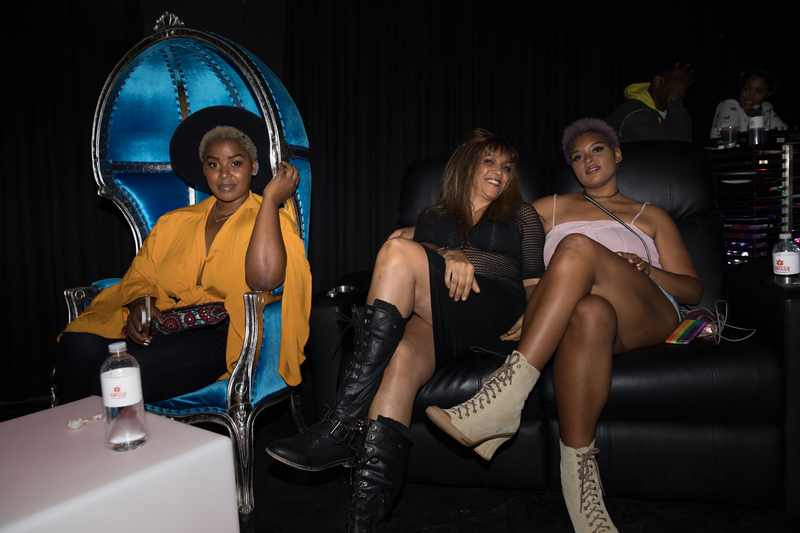 On its second night open, the Hologram USA Theater Karaoke Club attracted droves of young, talented singers from across Los Angeles who competed in a fiercely contested American Idol-style competition for a grand prize of $1,000. 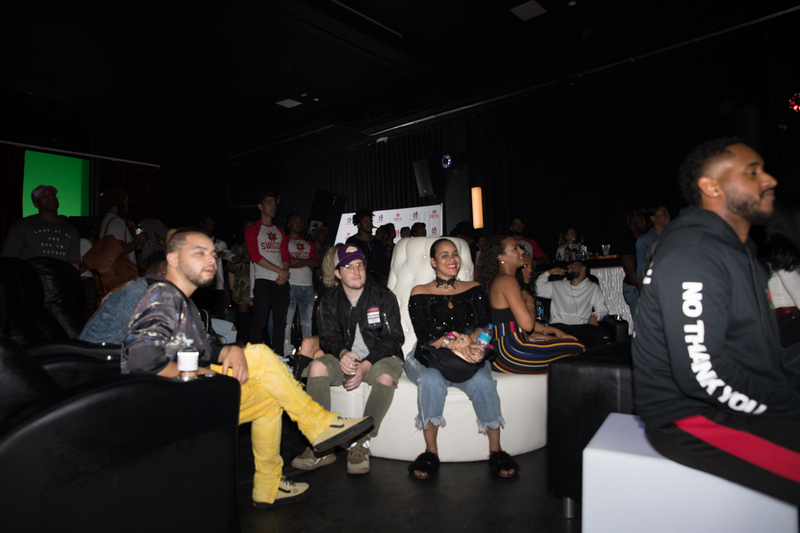 The drama and stakes of the night served as a proving ground for all sorts of relationships: friends competed against friends, former-strangers exchanged phone numbers and promises to collab, and the night’s breakout talent even caught the ear of an impressed record producer. As these Hollywood stories unfolded, a packed club booed and cheered for the larger-than-life holograms serenading them from the stage, wowed by the novelty of the first-of-its-kind venture and awed by the raw vocal ability on display. Orchestrating the whole operation is Alki David, the “eccentric” billionaire and head of the hologram company, Hologram USA. Since David acquired the hologram technology in 2013, he has expanded it into different sectors of media and society, from the Country Music Awards hosted by a hologram Jimmy Kimmel, to a Q&A with a hologram Julian Assange at the annual ideas conference, The Nantucket Project. 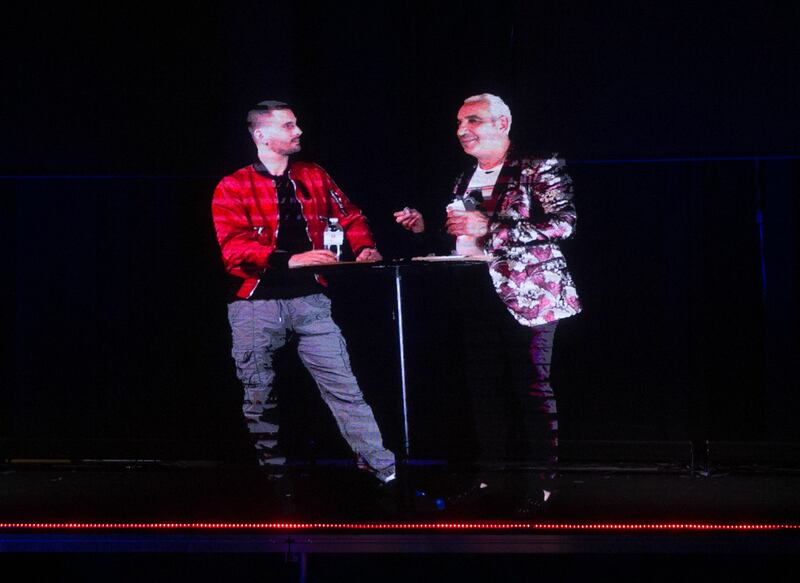 Hologram karaoke, while seemingly small fry compared to nationally televised award shows or geopolitical conversations with Julian Assange, fits into David’s multifaceted vision for holographic technology. “This is so disruptive, it’s disrupting the people who aren’t even disrupted,” he says from the green screen room overlooking the club. Behind David works his long-time associate, Ian Roberts, a 34-year-old Harvard graduate who specializes in Hologram USA’s patented hologram technology. “It’s a very involved process,” Roberts explains while standing over a desktop and mixing board. And he’s right. While media attention has largely focused on technology like virtual reality, holograms have matured under the radar, occasionally surfacing at large public events and spectacles like Coachella or Jimmy Kimmel Live. But according to David, this progress has been deliberate, as has its culmination in the karaoke club below him—a public manifestation of the technology previously reserved for celebrities and celebrity impersonators. Dozens and dozens of guests—numbering over 150 according to house estimates—poured into the theater on its second night, many of whom had heard about the venue from those who attended the night before. Some came with friends; others came on their own. Some planned on singing; others just wanted to watch. Of the singers, some came explicitly for the prize money; others just wanted the chance to perform and experience the on-stage/off-stage feeling of holographic performance. Like a reality TV show, the first rounds were a mix of humor (mostly intentionally), mistaken first impressions, and obvious pros. The musical genres were equally diverse, ranging from jazz (Frank Sinatra’s “Night and Day”), metal (Metallica’s “Wherever I May Roam”), to R&B (Al Green’s “Let’s Stay Together”). But while the music itself varied greatly, the stories of the singers largely coalesced around similar enduring themes of artistic pursuit and self-determination. Almost all of the performers that night, like so many others in the city, had come from somewhere else to be here—to hazard the risk of failure for a slim shot at success. One singer, Elijah Gregory, had charted a path all the way from Moscow, Russia, where he had sung professionally in restaurants, bars, and clubs. Elijah’s reasons for trekking out west go deeper than a hunger for fame. “If I’m totally honest, the reason I came here is because I am gay and in Russia that is illegal,” he shares, referencing the “Anti-Gay Propaganda” laws passed in Russia in 2013 that unleashed a torrent of anti-LGBT violence throughout the country. The night’s main drama, however, played out between two other vocalists, Kayln Litwin and Tyree Freely, both students at the local conservatory, American Musical and Dramatic Academy (AMDA). 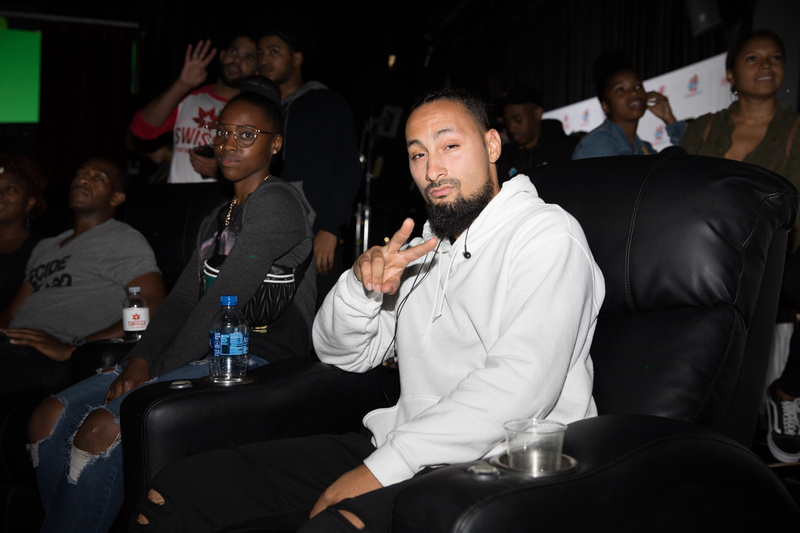 Tyree had come to the theater with a large contingent of friends from school to cheer him on as he performed that night (and vote for him, when the time came). Among those friends: Kayln herself, who said her main purpose in attending was to root for her friend. With the help of his friends, including Kayln—but mostly with his delicate, dexterous tenor voice capable of soaring vocal runs like Aaron Neville—Tyree easily beat the other three singers in his round to move onto the finals. Tyree, who is described by his friends as “the most damn good human being on planet earth,” came to Los Angeles by way of New Jersey. He plans to take some time off school soon for an upcoming stint performing on a cruise line. But Tyree’s all-but-certain victory and the $1,000 reward suddenly seemed less assured when Kayln, confident and poised, materialized on stage to the familiar synth-bass intro of Whitney Houston’s “I Wanna Dance With Somebody.” Kayln absolutely captivated the crowd with a nearly pitch-perfect rendition of the ‘80s dance anthem, exuding the energy and charm of Houston herself. Jaws dropped and eye-balls popped as Kayln handily reproduced Houston’s legendary range, nailing the song’s highest note, a B5 (B five octaves above middle C). “Whitney is my idol,” Kayln says, flush from her win. The Whitney Houston comparisons go beyond Kayln’s preternatural range. Like Houston, Kayln, who moved to LA from Atlanta, Georgia, grew up singing in church every week. Also like Houston, whose mother sang professionally, Kayln had the benefit of a mother who served as a choir director for 14 years. She says she doesn’t know what she would do if she didn’t sing professionally. The finals proved that Kayln’s performance was hardly a flash in the pan. She opted for an equally challenging song originated by another once-in-a-generation talent: “Love On Top,” by Beyoncé. The 3 minute song, which goes through a whopping four key changes, took Kayln right back to that stunning B5 she had nailed in “I Wanna Dance With Somebody.” At that point, victory was a foregone conclusion. She had won it all, beating even the friend she had come to support. But as the audience erupted in cheers when it came time to vote by applause, Tyree clapped along with the crowd, his hologram beaming at her hologram. The two hugged and congratulated each other after the walked off the green screen. For her part, Kayln could only register shock. “To be honest, I didn’t think it was real when I first heard it,” she said about the results. Adding to the moment, as Kayln’s friends and new admirers flocked around her, a tall man wearing a gold grill on the bottom row of his teeth passed her a slip of paper with his name and number. The man, Desmond Taylormade, CEO of New Legends Records, wanted to find some time to talk. But even amid the adoration and rewards, Kayln took a breath, steadied herself, and put it all in perspective. The Hologram USA Theater Karaoke Club is open Thursday, Friday, and Saturday nights. Three Family Friendly Halloween Movies You Can Watch on Netflix Right Now!